Capacity at San Diego International Airport is constrained by takeoff and landing slots. Instead, observers are thinking beyond downtown to make flying cheaper and more convenient. Twelve years ago, proponents of a plan to relocate the San Diego International Airport had a simple pitch: Way more people are going to use the airport in the coming years, and the current facility can’t accommodate it. Since then, the number of passengers boarding plans has indeed increased as envisioned by those projections, but the airport still isn’t close to maxing out its capacity. Last year, 11 million passengers boarded flights at San Diego Airport’s two terminals, more than ever before. That was led by a 14 percent increase in international passengers over the previous year, and domestic passengers increased nearly 7 percent. Air travel has recovered from the industry-wide slump following the 2008 recession, and San Diego is seeing the results. Those numbers are in line with projections made by advocates who wanted to move the airport, but they aren’t high enough to restart a conversation about the airport struggling to keep up with demand. “The numbers are clearly up, but they’re not hugely up,” said University of California, San Diego, economics professor Richard Carson, a longtime critic of that relocation campaign and the calculations behind it. The San Diego Airport’s capacity is primarily constrained by takeoff and landing slots; with just one runway, the old argument went, San Diego Airport wouldn’t be able to keep up with increased demand from an expanding population. But those projections overestimated population growth and didn’t foresee changes in the airlines’ business model that Carson, for one, said were predictable. As we reported three years ago, takeoffs and landings actually went down even while the number of passengers went up, because airlines shifted to larger planes and packed more passengers onto each flight. That trend has moderated slightly; in 2017, takeoffs and landings at San Diego were up by about 6 percent over 2016 levels. Carson praises recent airport management, but said San Diego should think beyond the downtown airport to make flying cheaper and more convenient. He’d like to see San Diego follow the lead of multi-airport cities like Boston and Washington, D.C., by reinforcing the runway at the McClellan-Palomar Airport in Carlsbad to be able to launch 737s to hubs in Phoenix, Denver or Chicago. Buttressing Carlsbad’s airport would be cheaper than building, say, a new airport at Camp Pendleton, an idea floated by Cal State University San Marcos MBA students back in 2015. But it might not get past local North County opponents who are protesting even modest improvements to the airport, citing noise and traffic concerns. Palomar saw a total of 164,000 takeoffs and landings last year, and the county expects that figure to reach as high as 208,000 by 2036. Passengers at Tijuana’s Gen. Abelardo L. Rodríguez International Airport also grew last year, thanks largely to increased use of the Cross-Border Xpress, a pedestrian bridge that gives direct access to the Tijuana airport from a terminal in Otay Mesa. The number of Tijuana’s total passengers grew 12 percent and “international travelers” grew 38 percent. That is thanks in part to 1.9 million CBX users, according to media reports. Improved access to Tijuana has made it easier for San Diegans to reach cities in Mexico, Central America and China. Making better use of Tijuana and Palomar would squeeze more capacity out of the region while dropping prices, Carson said. Moving air cargo and private jets to other airfields would free up even more room for passengers at Lindbergh Field. The capacity crisis, if there ever was one, has so far been averted. 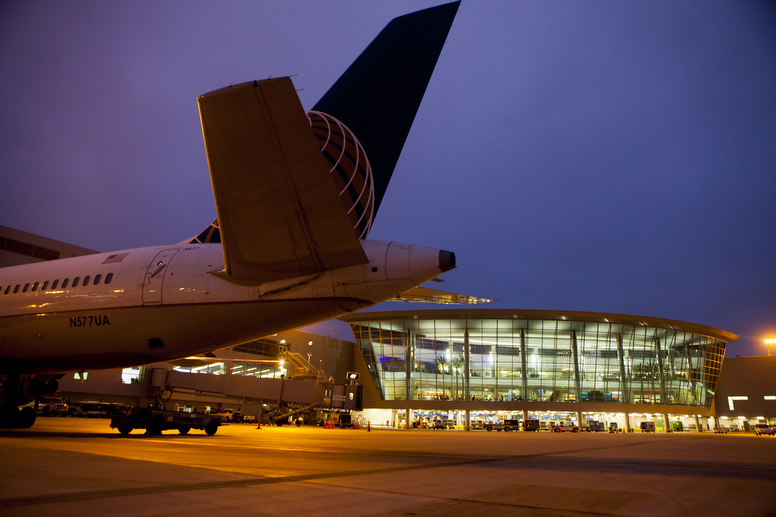 Instead, the Airport Authority is focused on replacing its half-century-old Terminal 1. Better access via public transportation is on the wish list, too, although funding for the proposed Intermodal Transit Center is still unclear after voters rejected SANDAG’s requested sales-tax hike back in 2016. A patchwork solution was implemented last year in the form of a Trolley-to-Terminal shuttle. Passengers can get off the Green Line in Middletown, haul their bags several hundred feet across Pacific Highway and pick up a free trolley to the terminals. Boling admits it’s not an ideal solution, but they’re working with what they’ve got. “We are focusing at making this airport the best it can be so the traveling public can get where they need to go,” Boling says. In the meantime, the Airport Authority is the subject of state legislation that would potentially put its decision-making responsibility back under the Port of San Diego, where it resided 15 years ago before becoming an independent agency. Maya Kroth is a freelance journalist who has written about bike lanes in San Diego, charter cities in Honduras, vermouth in Barcelona, water pollution in Guatemala and other far-flung topics.